Actually, it has been for a week. And I just didn’t get around to letting you know until now. I washed and blocked it last weekend. I used the blocking mat and T-pins from KnitPicks. The puzzle pieces worked really well. 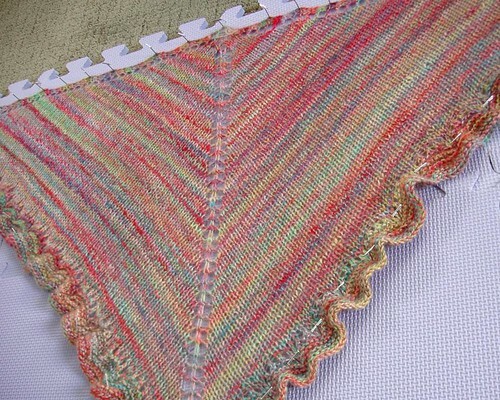 I just made a shape that matched the shawl! It looks pretty large, but it isn’t. And so I’m not entirely sure how to wear it. Considering I don’t have anything like this in my wardrobe already, I have no prior experience. 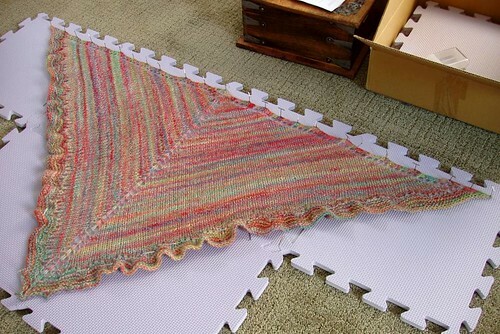 It doesn’t really wrap around, so I think it’s just going to sit on my shoulders as shawls tend to do. Pretty! Is it large enough to do the bandit-style thing in the front? Pretty, I like how large the yarn overs are. Hope you get a lot of use out of it.